There are many specifications to sort through, which can be a time-consuming process. On torqued.io, we offer über-specific filters to help you sort and drill down to what you’re looking for, fast. 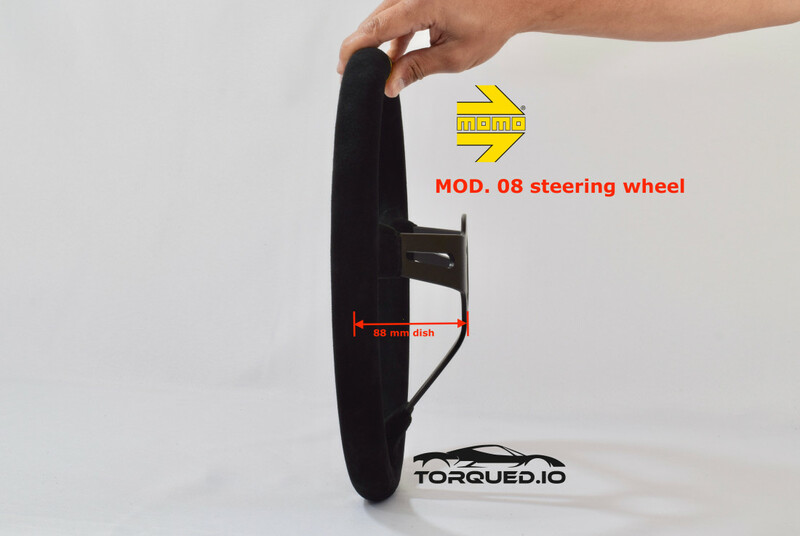 Steering wheel size, which is measured by diameter in mm, is a critical choice and there’s a very large range. 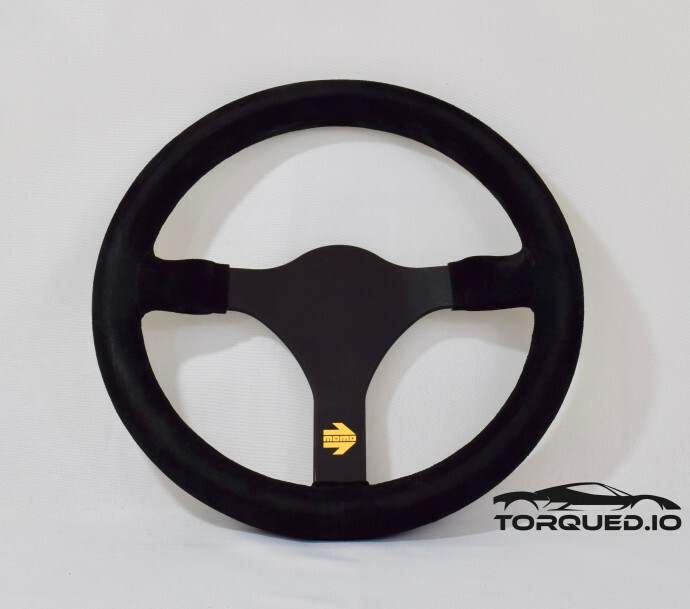 Of the wheels we sell at Torqued, there are at least 10 different steering wheel diameters.To make the best choice for you, consider what type of driving you’ll be doing and your preferences for visibility and accessibility. Is this primarily a road car or do you plan to mostly track it? The decision will be a tradeoff. Smaller wheels may be more comfortable and take up less space, but the smaller the wheel, the more steering effort required (more so on a car with no power steering). This is less important for a race car, where the most you may need to turn the wheel is somewhere short of 180 degrees. Do you prefer to look through the wheel or above it? You’ll want to ensure you don’t impair your visibility with too large of a wheel. What will be the impact of your wheel and seat type combination? For example, a large wheel and a deep seat may make it difficult to get out of the car without a quick release feature. As an example, in the picture at the top of the page you can see the MOMO MOD. 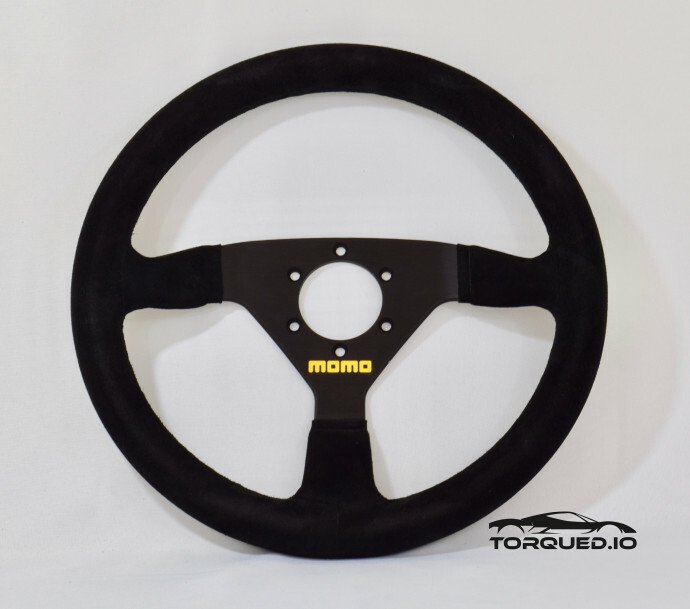 11 Steering Wheel 260mm Diameter , MOMO MOD. 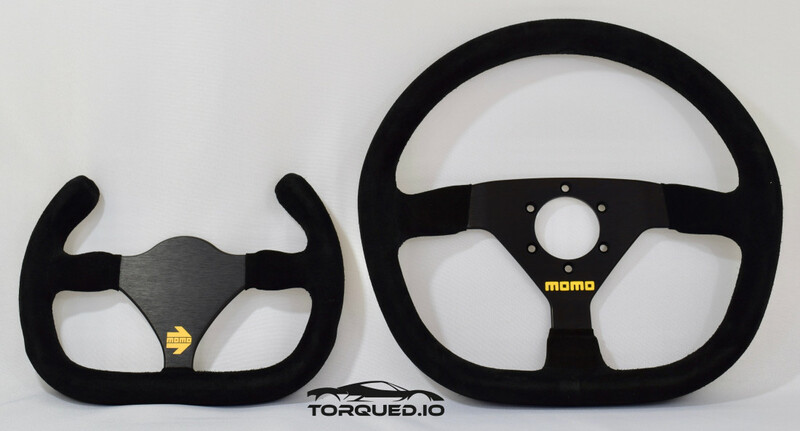 78 Steering Wheel 320mm Diameter Leather & MOMO MOD. 69 Steering Wheel (350mm) steering wheels. So, what is dish exactly? Dish is the distance (measured in mm) from the mounting surface to the center line of the steering wheel grip. Dish matters in two ways: the distance from wheel to driver and the distance of your hands from signal stalks, if there are any.Again, you should consider how you plan to primarily use the car. In a road legal car, having your fingers too far away from the blinker can be annoying. In a race car, an especially deep dish will bring the wheel closer to you, but may make getting in and out the car more difficult. Accessories like spacers and features like quick release can help mitigate some of these dish tradeoffs. As an example, the MOMO MOD. 08 Steering Wheel pictured above is a particularly deep dish steering wheel. Most high performance wheels including MOMO, Sparco and OMP are drilled as 6x 70mm, if they are drilled at all. This enables interchangeability with hubs, spacers and quick releases. We sell only this pattern or undrilled wheels and accessories. Generally speaking, only specialty wheels intended for formula or sim racing are undrilled. Pictured above are the MOMO MOD. 31 Steering Wheel and MOMO MOD. 69 Steering Wheel wheels. While these four factors are the most important steering wheel specs to consider, you may encounter other options. One example is fabric, typically leather, suede or alcantara. The choice here is about comfort, texture preference and durability.Given the broad range of wheel options, sometimes you just need to experiment with a few different configurations. With our No BS Return Policy, you can order several wheels and we’ll give you 30 days to return the unused wheels for a full refund as long as they are in new condition. And we’ll never charge a restocking fee. It seems so simple: just find a wheel that looks good, fits the style of the car and is comfortable to grip. That’s all. Buy it, install it, done. Well, maybe that works out, but it’s better to consider the more nuanced factors when selecting a steering wheel. Not only will you save yourself unnecessary returns, but you’ll also get a better driving experience. For example, we’ve had wheels that were the wrong dish. On a road car, it’s annoying to have your fingers not reach the signal stalk. Or for a road racing car with a deep racing seat, too large a wheel could necessitate removing the wheel with a quick release every time to get in and out. These are just a few examples of what you need to think about, so we’ve put together a quick guide to explain the four things to consider when buying a new steering wheel. Speed may get you pole, but you need racecraft to win. Follow this tutorial from world-class racing drivers, on how to master racecraft on track. http://SAFEisFAST.com is a free Online Driver Development program for aspiring drivers providing video tutorials as well as direct advice from today's top racers and industry experts. By: MazdaMotorsports.com | 11 hours ago While not a requirement, autocrossing can help a driver tackle a road course for the first time. Just ask Tamra Hunt.Tamra Hunt has been competing in autocross for five years, making four visits to Solo Nationals, where she has accumulated two championships and two second-place finishes.At each autocross event, track time is minimal compared to other racing verticals such as road racing. Most autocross runs last round 60 seconds. But according to Hunt, “Those 60 seconds are some of the most exhilarating moments of my life. Pure, raw driving with no fear of crashing. I get to push the car to its absolute limits… and it’s addicting.“However, when I tell people I race cars, their first question is usually. ‘Oh sweet; have you been to Lime Rock?’ (She lives in Connecticut, where Lime Rock Park racetrack resides.) Then I go into this awkward explanation of ‘No, I actually race in parking lots or abandoned airports on a course made of cones, and I’m racing against the clock, not wheel-to-wheel on a race track.’ In fact, I’ve never even been on a racetrack!”But Hunt decided to change that earlier this month, signing up for her first High Performance Driver’s Education (HPDE) day at New Hampshire Motor Speedway in a very low modified 2005 Mazda RX-8 Shinka. By: MazdaMotorsports.com | November 13, 2018 10:07 AM Jonathan Bomarito noticed a few things that racers needed help with at the Runoffs, and those lessons can be applied elsewhereAt the 2018 SCCA National Championship Runoffs, Mazda Motorsports once again brought some of its pro drivers to review video and data with club racers to help them improve their racing or setup. This year at Sonoma Raceway, it was Jonathan Bomarito, driver of the No. 55 Mazda RT24-P prototype in the IMSA WeatherTech SportsCar Championship, and Tom Long, who has raced everything from Spec Miata to the RT24-P. And during his coaching sessions, Bomarito noticed a few things many drivers could benefit from. Sonoma’s Turns 7a through Turn 9 are notorious for requiring precise car placement to get the most speed through that section and down to Turn 10. A small error early in the complex can be a big error by the time a driver is out of 8a. It’s not dissimilar to fast, winding sections at other tracks. By: RACER Staff | December 6, 2018 11:40 AM The old saying used to be, “In slow, and out fast.” But to win today, you have to be fast entering a turn, quick in the middle – and on max power at the exit. There are tenths to be gained everywhere.In The Secrets of Carrying Speed, the latest video by SAFEisFAST — the online resource for young drivers presented by Honda Racing/HPD — a group of very quick champion drivers explain just how to find those precious tenths. Want to learn from a two-time Formula 1 world champion? Fernando Alonso is our latest driver instructor giving young drivers a tutorial on how to be the best racer. is a free Online Driver Development program for aspiring drivers providing video tutorials as well as direct advice from today's top racers and industry experts. I started in racing at a very young age. My father found an old dirt-racing kart chassis and pieced together an asphalt sprint racing kart. He then somehow convinced my mother to take the entire family to the track every weekend, so my brother and I could race. We had a very small budget. I purchased my first road car at age 15 and reworked it to compete in autocross events. I sold this car after returning home from Army Basic Training shortly after high school, and my racing ambitions took the passenger seat while I pursued an Army career. I joined the Wisconsin Army National Guard with plans to go on active duty as an officer after college. With that, life, as it does, began to take me on a journey very different than one I ever anticipated when I was a car-shopping teenager. In 2009, I was deployed to Iraq as an infantryman. Shortly before my tour was complete, I was injured when a Mine Resistant Armor Protected (MRAP) gun truck weighing over 40,000lbs hit me from behind and drove up my left foot before coming to a stop on top of my thigh. Most of the bones in my foot were broken and some were missing. My left leg, left knee, both hips, upper back, and lower back all were injured as well. I was medevac’d and, thankfully, my foot was salvaged. I spent the next 18 months going in and out of surgery and physical therapy to repair the damage to my left leg and foot. My life would never be the same. While in the hospital, I found myself dreaming about racing – not unlike when I was 15. I started reading books about racing, and I even found myself buying go-fast parts for my Roush Mustang, although these purchases were made unknowingly by me as I was on very strong pain medication. Between surgeries I would go home. While still recovering and in a wheelchair, my brother helped me install a supercharger in my Mustang. I even modified my leg cast to be able to work the clutch to take the car for a test spin. At the age of 24, I needed a cane to walk, had very limited mobility, and had to deal with extreme pain every day. I was medically retired from the Army and no longer medically fit for duty. Before my injury I competed in paintball and soccer; now, I couldn’t play either sport in the same way. I did, however, find that I could still drive. I started driving in track events to begin honing my skills. And, when I was on the track, I did not have a disability. In 2013, my pain was increasing, and it was getting difficult for me to even perform daily functions. I was still in physical therapy and working with pain management doctors. Nothing was working, and this was not the quality of life I wanted. I was presented the option of having yet another surgery to fix my foot or amputating my left leg below the knee. The surgery would require another long recovery period, and even if it was successful, there was no guaranteeing a reduction in pain. The foot surgery would also likely require more surgeries with age. The amputation had a better likelihood of pain reduction, but there were obvious drawbacks. How difficult would it be to drive my Mustang — or any car — with a prosthetic leg? Still, I opted for the left leg amputation, which took place in October 2013. Soon afterwards, I was given the opportunity to attend a sport car racing event at Road America. CORE autosport hosted me and another disabled veteran at this event, and the weekend got me completely hooked on sports car racing. I was introduced to everyone on the CORE team and given a tour of their race trailer as well as the paddock. I watched the race from pit lane and listened in to all the activity on the team radio. I left that weekend knowing that more than anything else, I wanted to start sports car racing. When I am on the track, I am not disabled. I can compete on a total level playing field with other able-body drivers, something few sports can do. I wanted to share my newfound therapy with other disabled veterans, and started planning to build an endurance racing team for them. I soon learned about a non-profit organization called VETMotorsports, which honors and empower injured war fighters through active participation in motorsports. I started volunteering with VETMotorsports by arranging to host qualifying veterans at local SCCA autocross events, helping to put them behind the wheel and compete. VETMotorsports experiences provide direction, empowerment, and challenges that all of us with disabilities desire most: a mission and a purpose. VETMotorsports introduced me to Paul Pfanner of RACER Media & Marketing (which produces SportsCar and RACER magazines), and Paul in turn introduced me to Anthony Demonte, the CEO of Skip Barber Racing School. After sharing my story of recovery and my dream to start sports car racing, I was offered a seat in the Skip Barber Three-Day Racing School at WeatherTech Raceway Laguna Seca. There, I would experience my first professional driver training and, upon successful completion of the school, be eligible to apply for my SCCA Road Racing Novice Permit. I arrived at Laguna Seca early and found the Skip Barber team was already hard at work preparing their many Ford Mustangs for the class. After a hot breakfast and suit and helmet fitting, we all made our way to the classroom and were introduced to the Skip Barber staff. All of the instructors are very experienced — many were professional drivers with many hours logged on the racetrack — and we jumped into the classroom instruction. Things started slowly: We learned about traction and how weight transfer affects a tire’s contact patch. We learned about oversteer, understeer, and how to correct for both. But before I knew it, we hit the skid pad and an autocross course to put what we had just learned into action. After that, we returned to the classroom to learn about racing lines and how to read a track, and then we jumped in a Transit van for a tour of the circuit, stopping to walk certain sections. My major takeaway on day one was that the most minor elevation changes have a major effect on the car, and taking advantage of the positive or negative camber on the racing surface is key to squeezing out lower lap times. Day two began with more classroom instruction, covering downshifting and more technical racing-line talk. Then we all loaded into the Mustangs again to practice heel-and-toe braking. I knew going in that this particular area would be especially tough for me. I have no feeling in my prosthetic left foot, meaning I don’t really know where it is. In addition, to work the clutch I have to use my hip and knee; I have no ankle joint. While this may seem like it’s a physical hurdle, it affects me more psychologically. Consequently, I am so involved in making sure I downshift correctly that it takes my concentration away from what I should be focusing on. While I’m thinking about the downshift as I approach the corner, I really should be focusing on my braking and turn-in. Even before going to the school, downshifts were a big area of frustration as I never had a problem with them before my amputation. But with help from Mike Stillwagon, a lead instructor, I was able to get things under control and found a method that worked for me. I still need some practice, but I definitely am more confident working the clutch with my prosthetic now. We headed back to the classroom to discuss braking, and then once again hit the track to put the newfound knowledge into action. We had one more classroom session to talk about flags and technical racing lines, then we did some laps around Laguna while receiving feedback from the Skip Barber instructors. The feedback was fantastic — I learned so much in such a short amount of time. The third and final day began with a classroom session on passing and racing lines in the rain. We performed some passing exercises and then moved into more feedback sessions. The final classroom session was on race starts and restarts — and then we hit the track once more. I can’t say enough about how the information provided in these sessions has improved my driving skills. The Skip Barber instructors utilized bite-size pieces that allowed me to progressively improve; nothing was overwhelming. With SCCA Competition Novice Permit now in hand, what’s next for me? I will continue my learning through Skip Barber’s Two-Day Advanced Racing School, where I will earn my full SCCA Competition License. Then on to private coaching sessions with Skip Barber’s instructors, where I can learn the race craft I need to compete in this great sport. Gasp! he's using left foot braking at about 4 minutes! Savehttps://www.youtube.com/watch?v=Y2kPs3C1NC0 jaspal666Published on May 14, 2008Video from 1990. Story of Audi's quattro drivetrain in rallying, Pike's Peak hillclimb, SCCA Trans Am and IMSA GTO.